The majority of clinicians think of cerebral venous thrombosis as a primary venous sinus problem. It is certainly the more common scenario for the thrombus to start in the sinuses, and then perhaps propagate into the cortical veins. However, sometimes this is not the case. The cortical vein or veins are thrombosed, while the sinuses remain normal. It is important to realize that venous infractions which are the hallmark of cortical venous thrombosis result from occlusion of veins that have no collateral outflow. Occlusion of a sinus may be tolerated as long as veins draining into the sinus can decompress via some other route. It is only when such routes are unavailable, or likewise compromised, that issues happen. Therefore, primary thrombosis of a cortical vein is a dangerous situation — for example thrombosis of the right transverse sinus may not become a hemorrhagic brain infarct as long as the left side remains open. However, thrombus in the dominant vein of Labbe will be a problem, unless this vein is collateralized with some other vein that can decompress into an open sinus (such as Trolard or superficial sylvian veins). For discussion of dedicated venous anatomy, see Superficial Venous System page of the Venous Brain Anatomy group. 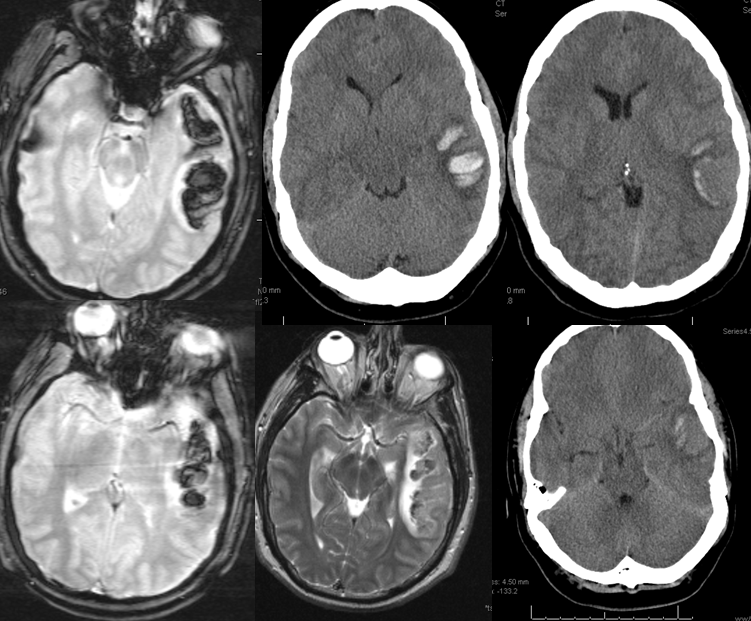 MRI (hemoflash and T2, and CT images of left temporal hemorrhage). Note to radiologists — please don’t ask to see the whole study — there is nothing suspicious there, believe me. Angio of the same patient — what is the diagnosis? 1) There are no normal veins seen draining the temporal convexity — this cannot possibly be normal. Deep sylvian veins and striate veins are there (unlabeled, see venous system for clarification) If you do enough angio, you will recognize that this appearance is very abnormal. Every other lobe has juicy veins, for example. 2) There is evidence of temporal lobe congestion, which is somewhat subtle, but present — in the inferior and superior temporal regions. The middle “layer” of the temporal lobe is hypovascular — corresponding to location of the clot — its a hyperemia-clot-hyperemia sandwich. As usual, cerebral venous thrombosis can be an elusive diagnosis — especially if the sinuses are not involved. But it certainly happens, and certainly more often than is known about. stereo pair of the same patient, can’t resist having one. Notice hyperemia adjacent to congested inferior temporal lobe vein, and clot-related lucency above it. This patient with Sickle Cell Disease presented with headache. 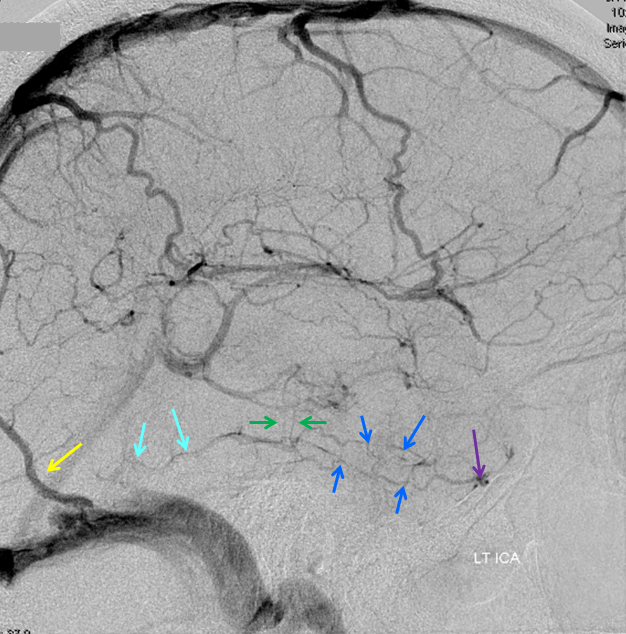 CT identified subarachnoid hemorrhage over the convexity (red arrows). The subtle hyperdensity adjacent to the left inner table was not appreciated initially (pink arrows). The patient was referred directly for angiography to look for the cause of subarachnoid hemorrhage. 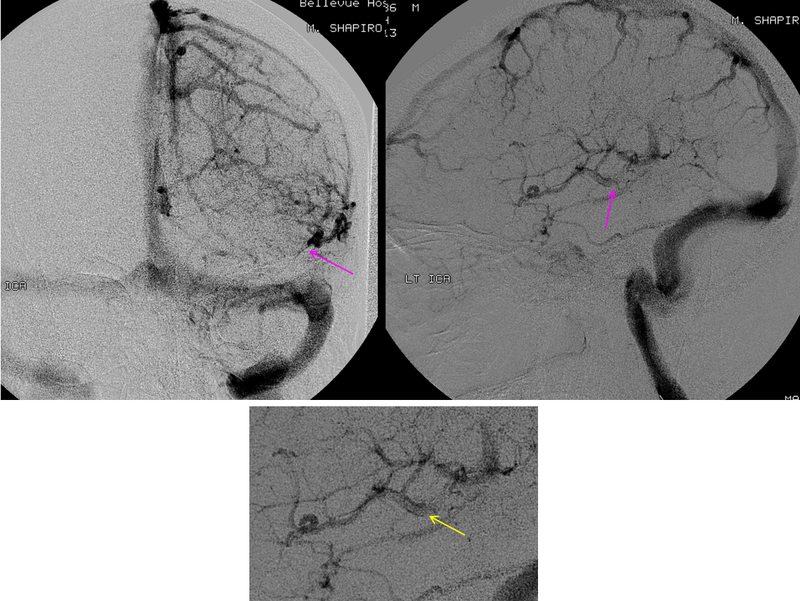 Frontal and lateral projection digital subtraction angiographic views of the left ICA injection, in venous phase, demonstrate abrupt cutoff (pink arrows) of the vein of Labbe. “Tram-track” sign of filling defect in the vein is actually seen on the lateral image (yellow arrow). The venous sinuses are fully patent. 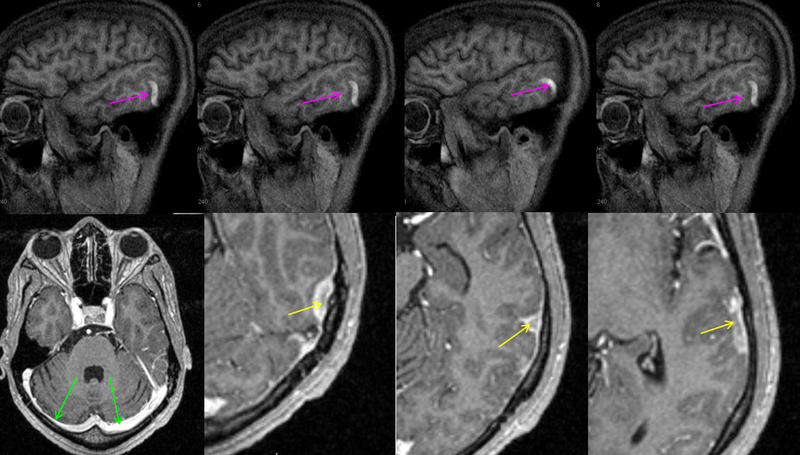 Subsequently obtained contrast MRI demonstrates nicely the hyperintense thrombus on sagittal T1-weighted imaging, and the intraluminal thrombus is seen on post-contrast T1-weighted images (yellow arrows). Again, the sinuses are patent (green arrows). Patients with sickle cell disease are, of course, at major risk for sickling, leading to both arterial and venous thrombosis.